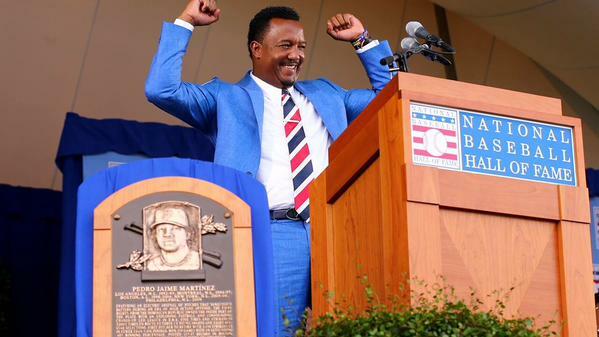 It’s been a busy week for Pedro Martinez. Between Cooperstown and having his number retired at Fenway Park he’s had little time to reflect. That same period has served as a great source of reflection for Red Sox fans. My memories of Pedro aren’t what I wish they were. International broadcasts weren’t great at the beginning of the last decade, so it was a lot of scores in newspapers (not box scores, just the team (home was always in capital letters) and how many runs each team scored). For that reason when I think of Pedro I don’t have as long a list as many who saw his every start. Five K’s in the 1999 ASG, 23-4, Six straight seasons with an ERA under three. The numbers don’t lie – he’s likely to be the best pitcher we ever see in Boston. Watching the ceremony from Fenway before the Wade Miley breakdown got me thinking about why Red Sox fans are so nostalgic for Pedro. The most obvious thing is the numbers he’s putting up. At a time when the pitching stock is smaller than it has ever been the thought of reliable pitching is heavenly. I don’t think that’s what’s got most fans lusting after the days of yesteryear however. When you look at Pedro around the guys he won the title with in 2004 it’s clear that they have something the current crop doesn’t. The bond between Pedro, Tek, Wake, Schill, Nixon and Ortiz that was on display eleven years after the historic victory is something to behold. That’s what the club is about – Unwavering support. That same support is currently lacking, not from a fan perspective but from those of the players. When you watch them every night you don’t get the sense they’d dive into a fire to save each other like the boys of 2004. That’s why this weekend has been such an emotional one for Red Sox fans. The longing for a return to the clubhouse where they’re all in it together. We’ll never see anyone wearing 45 at Fenway again. We may never see anyone with the talent of 45 pitching at Fenway again. Let’s just hope we see someone with his spirit – and soon. This entry was posted in Published on xavierplayer.com, Written and tagged Boston Red Sox, Pedro Martinez. Bookmark the permalink.